The idea sounds kind of neat — you go into an app on your smartphone, pre-order the amount of cash you’ll want to pick up from the ATM at a later point, then it’s waiting for you when you arrive. So-called cardless ATMs are being tested and some are touting the technology as the future of banking, but is it really that much of an improvement over the current system? Having not been able to test for ourselves, we can’t say for sure. But this American Banker article on the system being tested by Chicago’s Wintrust Financial is a good place to start picking apart the potential pros and cons. According to AB, the way it works is that the user, who has already associated a debit card with the Wintrust app on her phone, logs into the app and selects an amount of money to be withdrawn. When the user arrives at the ATM, she presses a button that brings up a QR code (those square barcodes that you see — but never actually scan — on the bottom corners of posters at the bus stop) for the user to scan with her phone. This triggers the ATM to dispense the pre-arranged amount of cash. Wintrust says it takes between 9-11 seconds to pick up one’s cash at the ATM, but we have some doubts about that claim. First, how long does the entire phone pre-ordering process take? Even the speediest app requires some startup time. And most bank apps require the user to log in each time, a process that often takes considerably longer than swiping a card and entering a PIN. Then there’s the scanning of the QR code. If the code is scanned directly through the app, then maybe it is a seamless process. But if the app has to launch a secondary scanning app, then it could take some time. Another possible plus for cardless systems is that it combats card-skimmers who attach illegal scanning devices to capture card numbers and PINs with the purpose of stealing the user’s identity (and money). It’s hard to skim a card if there is no card being placed into the slot. The concern here isn’t about skimming so much as it is about stolen and lost phones. While the Wintrust system stores users’ data in the cloud so that losing a phone isn’t the same as losing one’s ATM card, a user whose phone is not locked could be at risk for having someone else use it to withdraw money. Additionally, could a child or roommate potentially “borrow” a user’s phone and then use it to withdraw cash? At the moment, since only a few ATMs have the technology installed and only a few people are testing it, the crime concern is not really a huge issue. 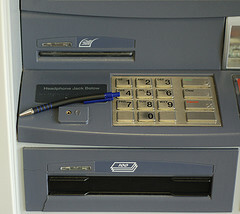 But before the cardless ATM is to be rolled out in any widespread way, security must be the primary concern. True, the cardless process does allow you to save time on the front end and order your cash at your leisure, but when it comes time to pick up the money, unless everyone at the ATM has used the app, you could still end up standing in line behind people who have no idea how to operate the machine. Cardless ATMs would allow you to stop worrying about accidentally sitting on your credit cards (or leaving them in your pocket when you do the laundry), or doing that that old rub-a-receipt-on-the-magnetic-strip-to-get-the-card-to-work thing… but only once they become the norm. Even if Wintrust gets the system working on 180 ATMs by the end of the year, that’s a molecule of water in a drop in a bucket compared to all the ATMs out there, so users would still need to carry their cards most of the time. We’re not saying cardless ATMs are a bad idea by any stretch. Smartphone apps will almost certainly replace debit cards within the foreseeable future. We just predict that there are just going to be a few speedbumps along the way.